Just like fingerprints, no 2 tongues look the same. You may not put much thought into how your tongue looks, but its appearance can say a lot about the state of your health. There’s a lot more going on with the organ than you might realize. 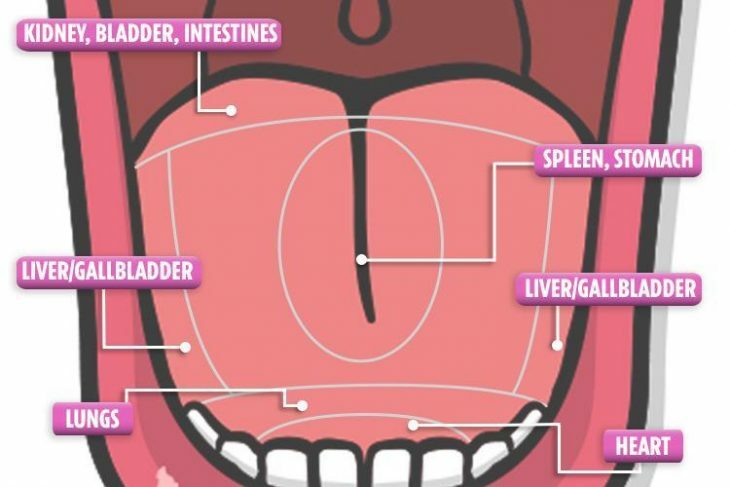 Different areas of your tongue represent different organs in the middle of your body. The sides of your tongue represent organs located on the sides of your abdomen, including the liver and gallbladder. The center of your tongue provides a glimpse of the health of your stomach. If your tongue is very red, it can indicate heat, such as a fever or a hormonal imbalance that is causing hot flashes or temperature changes. A purple tongue may be an indicator of circulatory problems, perhaps caused by a major injury or pain condition. It may also suggest that you have inflammation or an infection in your body. A pale tongue is associated with anemia or a long-standing illness that has weakened the immune system. If your tongue appears to be puffy and has teeth marks around the edges, this could be a sign that you are lacking nutrients and moisture. It could also mean blood stagnation and a buildup of toxins in the body. A very thin tongue points to possible dehydration or a chronic condition that has left your body severely depleted. You can tell an awful lot about your health by analyzing the coating on your tongue. A thick coating may mean you have poor gut health. A thin coating is normal, but if it’s extremely thin or non-existent, it could mean a lack of body fluids. It can also indicate that there is a great deal of strain on your body. A yellow coating points to heat and/or infection in the body. If your tongue has a thick, white coating on it, it can mean 1 of 2 things: Cold in the body, or a yeast infection (thrush). If your tongue has a gray or black coating – which would be startling – you should consider it a sign that something is very wrong with your health. If you have a bump on top of the tongue, you might have a bacterial or viral infection. It could also point to something more benign, such as an allergy to food or medication. 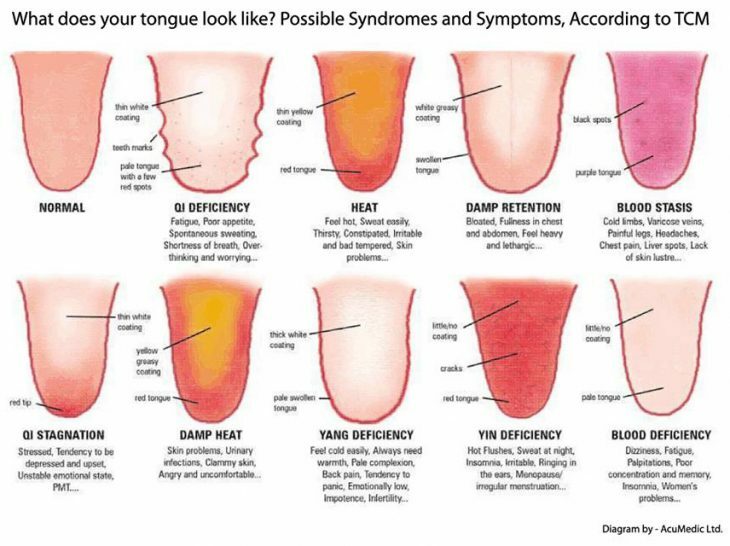 These bumps are different from canker sores, which appear on the bottom of the tongue. Canker sores can be identified by a round, red border and a yellow or white center. A condition called leukoplakia – a disorder of the mucous membranes caused by irritation from dentures, crowns, fillings, or tobacco use – appear as a white or gray sore with a hard surface that feels thick and raised from the tongue. Though it’s rare, some patches of leukoplakia show early signs of oral cancer. If your tongue kind of looks like a topical map, with patchy lesions that seem to change locations from day to day, it is indicative of a harmless but sometimes uncomfortable condition called geographic tongue. Have you ever heard of a condition called “scrotal tongue”? It sounds delightful, doesn’t it? Well, scrotal tongue makes your tongue appear wrinkly. Though it is usually a harmless condition, it can make it difficult to keep your tongue clean. If you have a combination of wrinkles and a sore or lump on one side of your tongue, it could be a sign of cancer. See a doctor immediately. You should also see a doctor as soon as possible if you experience burning, intense pain, loss of sensation, or an inability to move your tongue. Is the depth and length of the midline ‘crack’ in the tongue an indicator for something?